Skin Needling is a regenerative dermatological technique. It is safe to perform on all skin colours and skin types. There is no risk of subsequence inflamed hyper pigmentation. It is this safety function that separates Skin Needling from other invasive procedures for treating wrinkles and scars. The technique is based on a simple principle: the normal healing reaction starts immediately when damage occurs to the tissue. Blood components invade the injury area, and the blood plates make contact with the extra-cellular matrix. This contact triggers the blood plates so that they release coagulation factors, essential growth factors and cytokines. When the damaged area has been cleaned, the fibroblasts migrate to the injury area and produce and release new ECM. The new collagen matrix is then cross-bound and organised in the final remodelling phase, which can last up to 12 months after the injury occurred. Skin Needling with a skin roller produces hundreds of tiny injuries to the skin. Each tiny injury triggers the normal healing process in the skin and through repeated treatment, new collagen builds up gradually and thus fills the deep scar and lines. Generic regenerative face stimulation reduces the signs of photo-ageing and facial wrinkles (soft wrinkles). 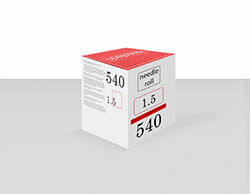 Needle Roll 540 head with its 540 micro needles allow you to cover a larger penetration area in a shorter time and can generate 1000 micro channels per square centimetres in ten minutes. This significantly increases the efficacy of the procedure. Stainless steel is scientifically proven to be the gold standard for tools that penetrate the skin. Needling Recharges have the same entry angle as subcutaneous needles, while Needling Roll 540 is diamond-shaped. The protective button gives you 100% protection against possible sources of infection. It is correct professional ethics to use disposable needle heads to reduce the risk of infections.